Memorial tiles are available for families and friends to purchase and personalize to remember their children. 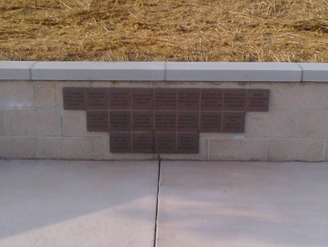 These tiles are placed on a “Remembrance Wall” to forever honor our lost angels. The memorial tiles are $150.00 each and can be purchased in remembrance of any child or loved one by their family members, friends, classmates, or teammates. However, the tiles cannot be purchased in memory of parents, grandparents, spouses etc. Each ceramic tile allows the purchaser to create a message in which to honor and remember their loved one. The forms can be found on our website: www.joshfoundation.org or www.angelofhopemaryland.org. Orders are placed in March so that we can have them installed on our Remembrance Wall in the spring. If you are interested in purchasing a tile, please contact us as soon as possible. The garden is open to the public and is intended to serve all bereaved parents, families and friends in the state of Maryland, who have suffered the loss of a child. Visit the Angel of Hope Memorial Garden website for more details or print a tile order form to memorialize your own special angel. We will share them on the “Our Angels” page.